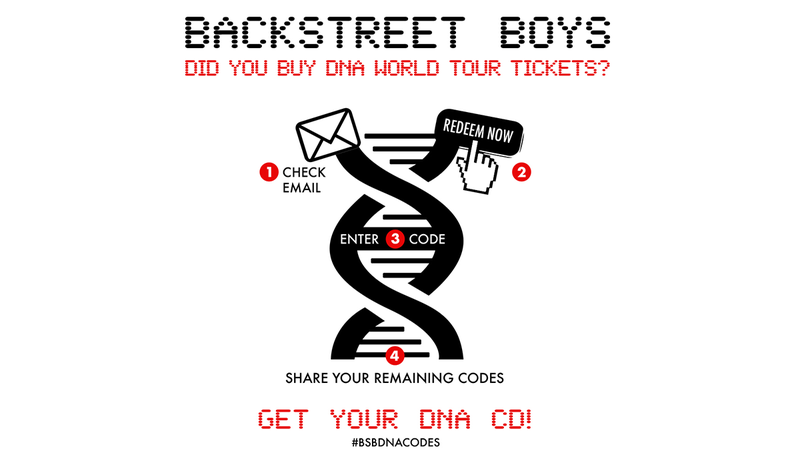 If you bought tickets to the DNA World Tour in the US or Canada, your purchase includes a physical copy of our new album DNA! All you have to do is follow these easy steps below. You can also click here to watch AJ give a video tutorial on how to redeem your DNA cd. We hope you love the album as much as we do. We can’t wait to see you all on the DNA World Tour! Step 1 - Open your ticket order confirmation email. Step 2 - Click the REDEEM NOW Button. Step 3 - Fill out the form and enter the redemption code from your email. Step 4 - If you bought more than one ticket, make sure you share the remaining codes with your friends. Step 5 - Check your mailbox for your CD. Once the CD is on the way, you’ll get an email with tracking info.